Eli Whitney, a young New Englander, invented a cotton "gin," which automatically cleaned cotton. 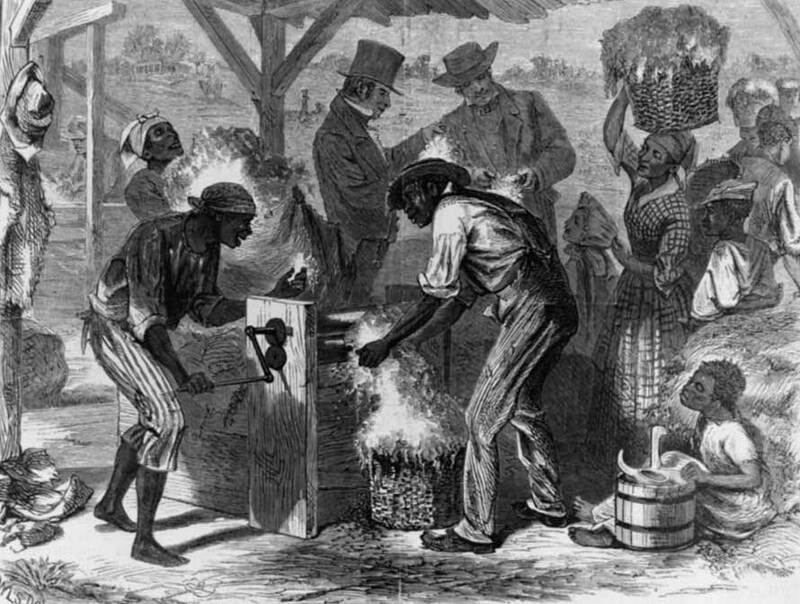 This transformed the Southern economy, making cotton "king" and greatly increasing the need for slaves. After the Revolutionary War the South was looking for a new crop to replace Indigo whose trade it had lost during the war to India. One possibility was cotton, but traditional cotton known as long staple or Egyptian cotton could only be grown on the Atlantic Islands of the US needing a very long growing season and sandy soil. The alternative was short season cotton, but that cotton has stickily seeds that were very difficult to separate. On to the scene came Eli Whitney. Whitney was born in Westboro Massachusetts in 1765. He was the son of a small farmer who had a small manufacturing business on the side. As a boy he produced nails for sail. He went to school in Yale and after graduating became a tutor in South Carolina. There he heard about how difficult it was to gin (or clean cotton) and he thought of a machine to do it. He studded a roller with nails a half an inch apart. The roller could then be turned and the nails would pass through a grid, which pulled the cotton lint through the grid leaving the seed behind. The lint would then be pulled off the nails while the seeds would fall off separately. A single laborer could now gin what it took 25 labors to do before, thus making upland cotton economically feasible for the first time.. Whitney received a patent for his invention, but since it was so simple many copied it. Whitney tried to enforce the patent. But it was very difficult. In the end most of the income that Whiney received from his invention was received not from producing it at a Connecticut factory that he set up, but instead from state governments. South Carolina paid him $50,000 to pay him for patent infringement in his state. $30, was given by North Carolina from a special tax placed on cotton to compensate him, and Tennessee threw in $10,000. The effect of the development cotton gin was unprecedented. In 1793 the United States produced about five million pounds of cotton almost all of it the Sea Island type, that represented less then 1% of the worlds production of cotton. By 1860 the US was producing 2 billion pounds of cotton over 75% of the world production.